I've been trying and trying and trying to figure out why this glitch keeps happening. 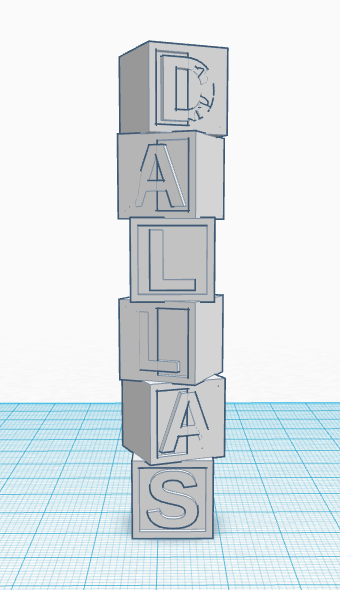 I'm trying to make a set of blocks to put into a shadow box and the current ones spell out the word "Dallas" and they need to be a certain size but every time I try to group them the holes I used to give an inset keep glitching horribly. I even tried to not group the whole set and download the .stl file and still the glitch happens. Even tried using the default sizes for the cube and while it's less noticeable it still happens.. It seemed to only happen when I turn the blocks though as the ones that are not turned don't seem to get the glitch. Well after 3 days I finally figured out what happened..